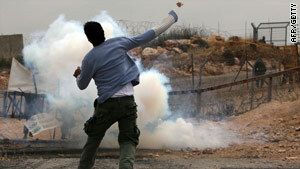 A Palestinian protests near Ramallah in the West Bank last month. On Friday a Palestinian teen was shot dead. Jerusalem (CNN) -- Authorities are investigating the shooting of a Palestinian teenager in the West Bank, an Israeli police spokesman said Friday. The body of Ayaser Alzaban, 16, was found late Thursday northwest of Ramallah, along Route 60, a road used by Israeli settlers in the territory, Palestinian medial officials said. Alzaban had been shot in the back. The death followed reports of an Israeli settler allegedly opening fire on a group that had been throwing rocks at his car as he drove. Israeli police spokesman Mickey Rosenfeld said the circumstances behind the incident were unclear, adding a police forensics team was involved in the investigation. At least four other Palestinians have died in two separate incidents in the West Bank since mid-March. The first incident happened on March 20 when two Palestinian teens were shot at a West Bank demonstration. The Palestinian Center for Human Rights accused the Israeli soldiers of intentionally firing at the two "from close range," killing them "in cold blood." The group said the two teens were not involved in protesting when they were shot. In its probe, the Israeli military called the demonstration a "violent riot" and said one of its soldiers testified that he "shot a number of rubber bullets toward the rioters" and that one Palestinian was identified as being hit. The Israeli military said it could not be determined whether live fire was used and that military police were still investigating the incident. In the second incident, which took place on March 21 near the West Bank village of Awarta, two Palestinian men were shot by Israeli soldiers while being stopped for a security check. According to the Israeli investigation of the incident, one of the Palestinian men "began acting suspiciously and finally assaulted one of the soldiers with a bottle." The probe determined "one of the soldiers felt his life was in danger and fired at the Palestinian." "At that point, the second suspect, who was a few meters away, raised his hand holding a sharp object, causing the soldier to believe, that he, too, was attempting to attack," the statement said. "As a result the soldier fired and killed the Palestinian." Residents in the area dispute this version of events and said the two men were innocent farm workers. The four killings over the course of one weekend brought strong condemnation from Palestinian officials at the time, and the results of the investigation were being watched closely.